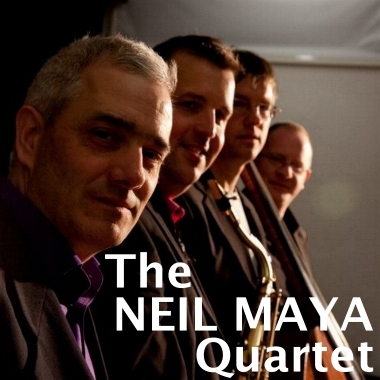 The Neil Maya Quartet is one of the UK's most exciting and talented bands. Their aim is to find fresh, new Jazz sounds and keep it appealing. In addition to playing innovative re-workings of Jazz standards and material by other composers, the band also plays many of its own compositions. Their style is often rooted in the sounds of the Cool Jazz movement of the 50s and 60s, yet they love playing other styles such as Funk, Samba, African, and Folk Rock. The quartet’s music is crisp, cool, colorful, sassy, smooth, atmospheric, and intricate. The quartet is always striving to find different ways to deliver Jazz. Although the soloing aspect is central to its approach, its music often tells a story that takes you on a journey across a wide and rich emotional landscape. Cool, laid back jazz based on a traditional English tune with alternating leads from tenor sax and piano creating a mellow, chilled, atmosphere crossing over the usual boundaries to reach a wider audience, with ideal suitability for Film / TV or Media placements, Instrumental, Christmas, Xmas Jazz Ens. Full Track - Christmas, Xmas Jazz Ens.